Home > Blog > Is your cup of coffee about to get more expensive going in to 2019? Coffee prices have been sliding for years, dating back to 2016 and the conventional wisdom is that a record harvest expected this year in Brazil, the world’s largest producer of coffee, is set to keep prices low. However, according to a recent report from Barron’s, prices for coffee could take off going into 2019, which isn’t great for those coffee fiends out there; it looks like your cup of joe could get a bit more expensive. In this post, we’ll be taking a look at current real-world examples to show how supply and demand and other market forces can impact the raw materials prices of some of the typical ingredients of a cup of coffee and how that is likely to influence how much you pay for one going into 2019. Could coffee prices jump in 2019? Recently, Arabica coffee prices have been on the decline on the aforementioned expectations of a record Brazilian harvest in 2018/2019 and increased supply from other major producers. According to the United States Department of Agriculture (USDA), Brazil’s harvest is likely to come in at 44.5 million bags of the highly prized Arabica coffee beans. This would come out to about 44% of the world’s global harvest, up from 41% last year. Conab, the state agricultural information agency of Brazil, is predicting a record harvest crop of 58 million bags and according to the Financial Times, some estimates from traders are as high as 65 million. These figures likely include the harvest of the less desirable Robusta coffee beans, which the USDA estimates will come in at 15.7 million bags in 2018/2019. Each bag weighs about 60 kilograms or 130 pounds, so doing the math, that’s a lot of coffee. With forecasts for the harvest so high, hedge funds and other speculators have piled into the market to bet against coffee prices in futures markets, a wager that has been made all the more attractive given the weakening Brazilian real. A weak real is attractive to producers as it means they will be able to make more money from dollar sales when converting the money back into their domestic currency, giving them an incentive to produce and sell more. 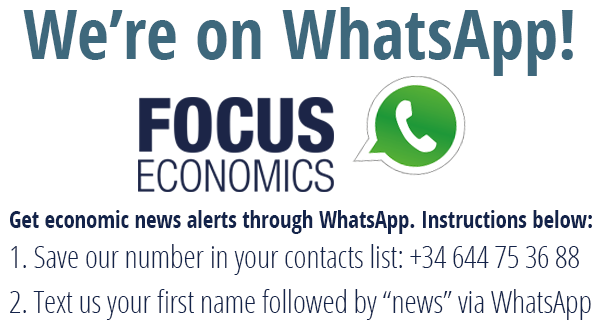 Although, the real has strengthened in recent weeks, recovering some of the losses from the emerging market currency sell-off seen in April, FocusEconomics expects the real to stay at current levels and come in at 3.70 per USD at year-end. In 2019, the real is seen ending the year at 3.65 per USD. A record harvest forecast in Brazil, so what's the problem? So, you may be asking yourself as a coffee drinker, what’s the problem? It sounds like everything is poised for coffee prices to stay depressed, right? Well, not so fast. Despite a record harvest looming on the horizon, the combination of a poor harvest last year and lower interest rates in Brazil means that producers have extra capacity and a financial buffer to hold onto the harvest rather than sell. This would effectively create a shortage in the coffee market, pushing prices up. Why would the producers do this? Well, simple economics is at play. The current low levels of coffee prices means that selling at those levels would barely cover the cost of production, so they may rather sell the minimum necessary and hold onto the rest to wait for the price to go up. Mother Nature to rear is ugly head? Another reason that prices could potentially go up has to do with Mother Nature. Weather is the quite possibly the most poweful force on earth and therefore it plays a major role in determining the future direction of commodity prices especially agricultural commodities. With regard to coffee, stronger production in the harvest, which began in March, has been supported by favorable weather conditions in Brazil. However, these favorable weather conditions may begin to turn unfavorable in the near future. A dry weather system has been forecast lately, which could stunt the next year’s crop. According to Jim Romer, co-author of the Climatelligence Report, a global commodities and weather newsletter, prices could jump “40% to 50% by winter” if a severe drought does indeed materialize. The unusual El Niño Modoki weather system could be the catalyst for such a drought. The El Niño Modoki is a coupled ocean-atmosphere phenomenon in the tropical Pacific, which differs from the more well-known El Niño. If it does come to pass, it would result in dry weather and hit Brazil’s coffee-growing regions, significantly impacting Brazil’s harvest, as dry weather is not good for the crop. Short positioning to lead to skyrocketing coffee prices? Going back to the speculative bets on lower prices, according to a report from the Commodity Futures Trading Commission, hedge funds have sold about 126,000 contracts betting on prices declining versus just 36,000 contracts betting on an increase in prices. This is up from 66,000 short position contracts 12 months ago, while the number of contracts betting on increasing prices have stayed the same. These speculative bets on declining prices represent approximately a third of all coffee contracts outstanding, which is up from around a quarter last year. So why is all of this short positioning significant? If prices of coffee do indeed increase, those traders that have bet on a continued price decline will likely attempt to exit their positions to mitigate their losses, as futures bets in favor of a price decline lose money when the price increases. Those traders looking to exit will likely do so by purchasing futures contracts, and when all do so at once, this should send prices skyrocketing. Arabica coffee traded at USD 109 cents per pound on 3 August, however, FocusEconomics expects prices to average USD 125 cents per pound in Q4 2018 and 141 cents per pound in Q4 2019. The good news is that if you take milk with your coffee, you might be able to offset some of that coffee price increase. After a 2017 that saw world supply and demand narrow amid decreased production from major global milk exporters and stronger demand from major importers China and the ASEAN countries of Southeast Asia, global dairy prices in 2018 have fallen precipitously. New Zealand has begun to ramp up production in recent months suggesting stronger global supply. The New Zealand milk cooperative controls about a third of the world’s dairy trade. In addition, demand from heavyweights China, has fallen, due to a weakening yuan against the USD as well as the New Zealand dollar amid an escalation in U.S.-China trade tensions. It seems that global dairy prices are likely to stay low for the foreseeable future. Unfortunately for those vegan, vegetarian and other assorted soymilk fans, soybean prices are expected to increase going into 2019. Soy milk, a derivative of soybeans, might not be the best choice for your coffee creamer if that is the case. However, prices have rebounded over the past few days, after tumbling to multi-year lows in early July. The EU and U.S. have recently agreed to pause what was a fast-brewing trade dispute between the two major trading partners, representing a positive demand-side development for soybeans and supporting prices. Moreover, data released on 30 July showed that EU soybean imports from the U.S. nearly quadrupled in July year-on-year. On 3 August, soybeans traded at USD 857 cents per bushel, which was 5.3% higher than on the same day last month. It's also important to note that China seasonally begins to make their largest purchases of soybeans in October. Despite its retaliatory tariffs on U.S. soybean exports, prices are expected to increase with the likely increase in demand from China this autumn. For Q4 2018, panelists expect prices to average USD 990 cents per bushel. For Q4 2019, panelists project prices will average USD 1,027 cents per bushel. If you take sugar with your coffee, you might also be able to offset some of that increase in coffee prices, as sugar prices are at multi-year lows at the moment and don’t look likely to be increasing much in the near-term. Sugar prices have tumbled recently amid near-record global production. According to the Global Sugar Alliance, this is largely to do with a ramping up of production in the European Union, India and Pakistan because of government sugar subsidies that have made production attractive despite low demand and low prices. Sugar traded at USD 11.5 cents per pound on 3 August. The price was 3.9% lower than on the same day last month, and was down 24.0% on a year-to-date basis. Moreover, the price was 22.9% lower than on the same day last year. The global supply glut should largely keep prices low for the foreseeable future even as production in the world’s largest producer of sugar, Brazil, weakens. According to a Bloomberg report, despite sugar prices at multi-year lows, an increase in demand for sugar has proven elusive. Exports of Brazilian sugar are down 25% so far in the 12-month season that started in April compared with the same period a year earlier. Nonetheless, prices will likely rebound somewhat by year-end thanks to weaker production in Brazil and the gradual absorption of the global surplus, however, prices will still be low. Analysts expect prices to average USD 12.6 cents per pound in Q4 2018 and USD 14.0 cents per pound in Q4 2019. Unfortunately, lower sugar prices aren’t likely to make your cup of coffee much cheaper. To quote the Beastie Boys, unless you take your “sugar with coffee and cream,” expect to be paying a little more for your cup of java in the near future. If you are interested in more commodities price forecasts and written analysis, take a gander at one of our FocusEconomics Consensus Forecast Commodities reports. We cover 30 commodities, including energy commodities, industrial and precious metals as well as agricultural commodities with five-year Consensus Forecasts on prices. Click on the link below to download a sample report.